How to tell what Generation your Glock pistol is by the different grip patterns and designs. 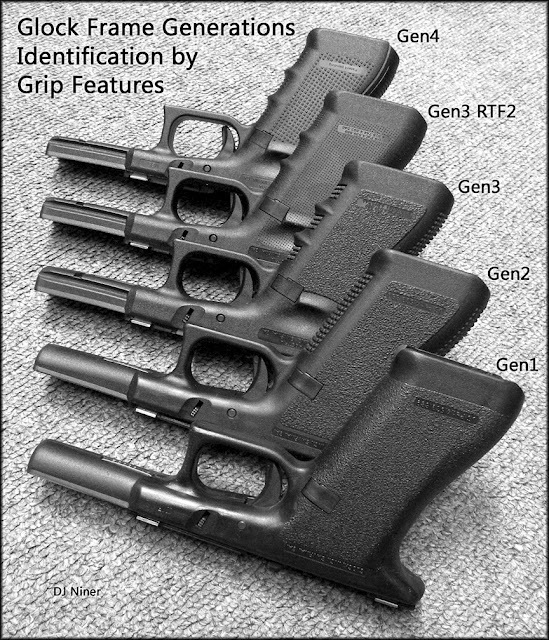 If you plan on accessorizing your Glock then get a Gen 3. There's more accessories available. The following are the Austrian Ministry of Defense specifications that the first Glocks were designed to meet. The design has to be self-loading. The pistol must fire the NATO-standard 9×19mm Parabellum round. The magazines would not require any means of assistance for loading. The magazines must have a minimum capacity of 8 rounds. All actions necessary to prepare the pistol for firing and any actions required after firing must be done single-handed, either right- or left-handed. The pistol must be absolutely secure against accidental discharge from shock, stroke and drops from a height of 2 meters onto a steel plate. Disassembly of the main parts for maintenance and reassembling must be possible without the use of any tools. Maintenance and cleaning of the pistol must be accomplished without the use of tools. The pistol's construction may not exceed 58 individual parts (equivalent of a P38). Gauges, measuring and precise testing devices must not be necessary for the long-term maintenance of the pistol. The manufacturer is required to provide the Ministry of Defence with a complete set of engineering drawing and exploded views. These must be supplied with all the relevant details for the production of the pistol. All components must be fully interchangeable between pistols. No more than 20 malfunctions are permitted during the first 10,000 rounds fired, not even minor jams that can be cleared without the use of any tools. After firing 15,000 rounds of standard ammunition, the pistol will be inspected for wear. The pistol will then be used to fire an overpressure test cartridge generating 5,000 bar (500 MPa; 73,000 psi) (the normal maximum operating pressure Pmax for the 9 mm NATO is rated at 2,520 bar (252 MPa; 36,500 psi). The critical components must continue to function properly and be up to specifications, otherwise the pistol will be disqualified. When handled properly, under no circumstances may the user be endangered by case ejection. The muzzle energy must be at least 441.5 J when firing a 9mm S-round/P-08 Hirtenberger AG. Pistols scoring less than 70% of the total available points will not be considered for military use.